Revenue from customers is your company's lifeblood. It helps your business sustain and allows it to grow. But the customer acquisition costs (CAC) that come with each and every new customer leech away that essential revenue, and work against financial growth. This is the paradox of customer acquisition. You need it, but these costs drain your lifeblood. It's essential then that you understand your CAC precisely, so you can set goals that will both compensate losses and generate profit. You need your customer lifetime value to be greater than CAC by 3:1, but you'll only be able to benchmark this ratio by knowing your CAC. Companies often miscalculate CAC and then make calculations with skewed numbers. This jeopardizes the true value potential of your customers, the plan for your growth, and the way you monetize. You can't afford to get it wrong. Below we'll go through some common mistakes made in calculating CAC, and see how you can set yourself up for success, the right way. You invest a lot in your SaaS startup - capital to get things going, hours of hustle, tons of brain space. And each time you spend money to acquire a customer, you make another investment in the company's future success. It is crucial that each customer pays back its cost of acquisition and generates a healthy profit on top of that in order for your business to be viable. How much you spent to acquire them. Customers are paying back their CAC in fixed increments over time. The total costs of acquiring them directly affects how long it takes them to pay back their CAC and start generating profit. How you've monetized them. You want to make sure your customers are paying exactly the right amount for exactly the right value. That's why it's important to focus on the key pillars of positioning, packaging, and pricing in your monetization strategy. How long they stick around. The longer a customer stays and pays, the longer your opportunity to maximize that customer's lifetime value (LTV). There will almost always be a lag, but your goal is to make that payback period as short as possible. A correct CAC value will allow you to set a goal for the minimum LTV of your ideal customer to achieve the goal 3:1 ratio. 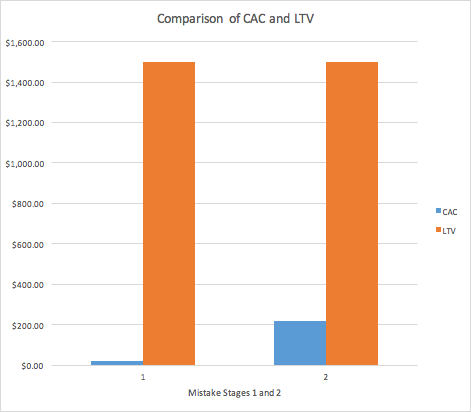 The chart below shows hypothetical data of three different companies that have different LTV:CAC ratios and recover their CAC at different rates. The three companies have different average monthly payments. All have the same gross margin percentage, the same CAC, and the same monthly churn rate. Company A has a customer LTV of $21,000 and has an LTV:CAC of 5. Their payback period is 4 months, which means that they can get money spent on customer acquisition back faster and re-invest it into other parts of the company. 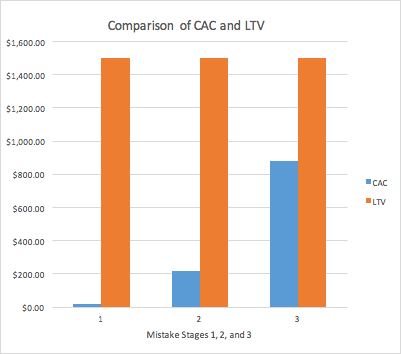 Company B, with an LTV of $12,000 and an LTV:CAC of 3, takes 12 months to recover CAC. A year is a good benchmark for full repayment of CAC, although a shorter payback period would help this company to grow faster. 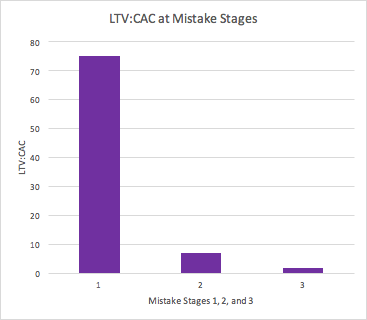 Company C isn't seeing CAC recovered until 20 months out—but their LTV of $4,200 and LTV:CAC of 1 didn't offer a good prognosis. With a lifetime value exactly equal to the CAC, Company C only just breaks even for that customer over the entire course of the customer's lifetime with the company. For 20 months before they break even, they're scrambling for cash. This is not a sustainable business model. These example companies show how important monetization is to your company's payback period and LTV:CAC ratio. Companies that have a higher average monthly payment don't necessarily just charge more—they just know how to correctly charge each customer so that customers are paying the right prices for the right value. This could be the difference between desperately paddling versus riding the wave. LTV and CAC are intertwined in determining the ultimate value of the customer. Benchmarking a goal for LTV based on LTV:CAC will allow you to maximize the net gains from each customer. Working with an incorrect CAC completely skews your LTV goals and will leave you with an injured cash flow. Don't put yourself in that vulnerable position. If you avoid these four stages of mistakes, you can be sure your CAC is fully-loaded and have confidence in your calculations. Yet this framework has a lot of room for error. What are the total expenses to acquire customers? 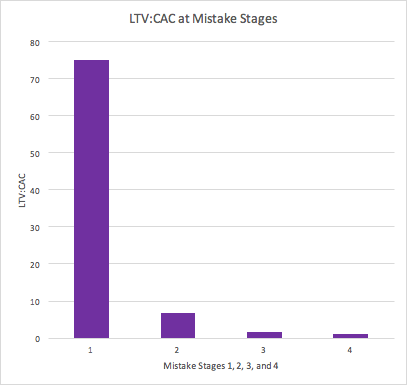 Below we'll walk through four stages of CAC calculations and show how mistakes along the way can have resonant effects. Imagine the average lifetime value of a customer is $1,500. By these calculations your LTV:CAC is an astronomical 75. Boom! Such a low CAC in comparison to your LTV yields a very encouraging LTV:CAC ratio well above your target of 3. But you should not be celebrating yet. It's easy to only consider paid advertisements because they are the most obvious expenses that directly bring in customers. But you'd be missing a huge chunk of your acquisition expenses if you stop here. 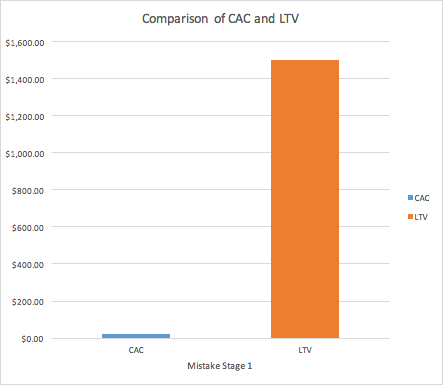 The CAC visibly increases when compared to the unchanging LTV. This increase in CAC dramatically lowers the LTV:CAC in comparison. The LTV:CAC fell from 75 to 6.8—meaning the additional expenses that increased your CAC hugely affected this ratio. Though the LTV:CAC is lower, it's still above the target of 3. It would be tempting to say that you're still set up to be very profitable. But at the end of the day, these advertising and marketing programs aren't running themselves. 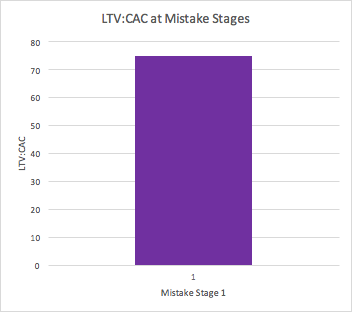 The CAC is now over half of the LTV. The LTV:CAC ratio has dropped to an alarming 1.7 with the CAC increase. Your LTV:CAC is now far below your ideal 3:1 ratio simply because you've miscalculated the numerator of the CAC equation—the total expenses to acquire customers. But if you haven't been careful with your denominator you might have to adjust even further. Out of the 50 customers that started using your service in the past month, maybe only 30 of them are on a paid plan. 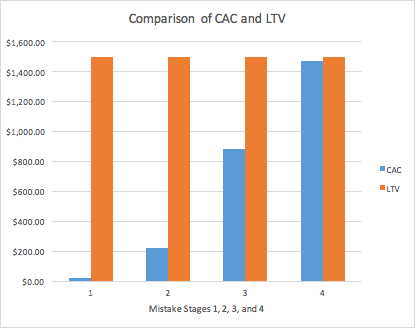 With an LTV:CAC of 1, the LTV and CAC are almost equal. You're barely breaking even on your CAC over the entire course of the customer's lifetime at your business. 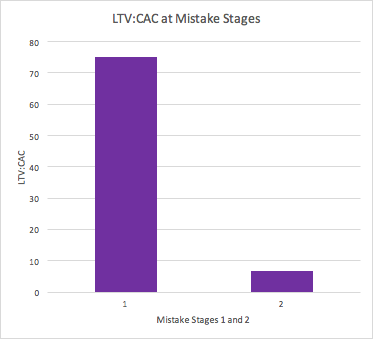 These mistakes show that incorrect CAC calculations can cause the LTV:CAC to fluctuate between 75 and 1. When you're calculating CAC, the devil is in the details. In this example, any oversight or miscalculation along the way could have led you to a calculate a CAC as low as 1/75 of your fully loaded CAC. If you had known your fully loaded CAC was $1,467, you could have set a goal for the ideal customer's LTV to be at least $4,400. But if you had calculated your CAC to be anything less, you'd unknowingly aim too low. This lays the foundation for very misguided and possibly detrimental future business decisions. When it comes to your CAC it literally pays to be meticulous. You want to consider every detail and potential caveat in both total acquisition costs and acquired customers to determine your true CAC. You might not want to think about how much you are spending on each and every customer, but it is imperative to calculating the right unit economics for your business. Remember when you're thinking about your CAC that it isn't a race to the bottom. Though it's helpful to your cash flow to pay less to acquire each customer, the very cheapest customers aren't necessarily the ones you want to acquire. They won't see the value in your product and might not stick around for very long. That's why it's important to know how you're going to monetize your customers once you've acquired them. You want customers that are going to stay and pay—this is how you'll achieve an LTV that will pay back and earn profit past your CAC. Start with good fundamentals. Calculate your CAC correctly and lay the groundwork to master your SaaS metrics and build your company's success. P.S. To help you keep your finger on the pulse of customer activity, we created a free software called ProfitWell. Check it out!